Confession of a Guy who a’int in no sports !! That time of the year when everyone seems to be going gushing over football and rooting for their favorite team, and here I am the odd one out!!! Wouldn’t care a damn if Pakistan won the world cup, btw is it even playing??? I react the same way as a fish would seeing a net, I run as fast (not that I can run very fast) to avert being caught in the net. I managed to slip away from the net till I was studying in Udaipur but like they say बकरा कब तक खैर मनायेगा!!! And in the year 1988, in 6th standard I was put in a boarding school i.e. the prestigious all boys school The Mayo College, Ajmer. Here I had no option but to play sports as it was mandatory. And I played them all – Football, Hockey and the Famous Cross Country race. Being someone who was just not into sports it took a lot to play these games. Played Hockey and Football always in a position of defence i.e. of a backie didn’t really matter whether it was left, right or centre, I wanted to stay as far away from the ball and the only goal I scored was against my own team , alas it was a self goal. Another tiring and irksome sport was the Cross Country , in Mayo they made us run God knows how many miles over broken roads , dry nallas. Those were enduring times and I managed to finish the race only once in my 5 years of my most action packed sports life of Mayo. Then somewhere in 1992 Cricket World Cup happened if I m not wrong it was happening in Australia and my dear friends would stay awake all night to watch them. But for me my sleep was sacrosanct and could not be compromised for a match of Cricket. Owing to the peer pressure I did try to savour Cricket but the most I could manage to watch were the highlights that also I thought was like an entire match in itself. Earlier they were just playing in some cricketing months and now they just need a reason to play the game. Test, One Day, 20:20 , IPL, Champions League. Dear Cricketers don’t u have anything else to do, seriously I am like घर जाओ , बीवी बच्चों के साथ थोड़ा time spend करो ….. 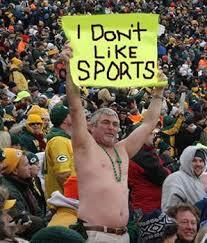 It was only after I came to college I stopped pretending and saying it like it is, that I dnt enjoy watching sports. I would rather watch a rerun of a good movie. I envy the guys who can enjoy the game that’s a character flaw that I have, that stops me from being a sports buff…. So guys enjoy ur sports but don’t fill my timeline every time a goal is missed, a wicket taken or a cup lost. Just isn’t interested period. PS: This piece was written during the Football World Cup 2014.